We’re currently redesigning our website at The New York Law Institute library and our goal has been to create a user-centered design with lots of input from our actual members and users. We started out by conducting a complete heuristic evaluation of our website interface and structure to identify problems and pain points. We also performed a content audit in which we created and analyzed a complete content inventory of our site. See below for some helpful how-to guides to get started with these types of exercises. These were great starting points because we were able to identify and analyze what we currently had to offer as far as our website experience. A redesign doesn’t mean that you throw everything out and start from scratch, so we wanted to leverage what we had that was working but also think about new ways to provide a better user experience. We decided to re-write quite a bit of our content before even starting to build the new redesign and that was an easy and manageable first step. After we analyzed our current website structure and content, we came up with a strategy for how we wanted to improve it. We came up with improvements such as making our design responsive so that it would adapt to any size screen for our mobile users, drop-down menus for navigation, a site-wide search that would also allow for catalog and federated search options, an improved events calendar, etc. Next we wanted to use language and navigation that our members would find the most natural. To this end we conducted card sorts, both online and live, face-to-face. Card Sorting is a method or technique for discovering how website users categorize information so that you can design your information structure in a way which is navigable and findable by your users. The method involves asking participants to sort sets of cards which have items, names, pages, or sections of your website printed on them into groups that make sense to them, and sometimes to assign labels to those groups. This type of usability study can be conducted in person and/or completely online. I have a workshop with step-by-step instructions for implementing a card sort available here. This workshop will also walk you through how to analyze the data you collect from your sort. And please see below for some free online card sorting tools. The results of the card sort usability tests that we ran were invaluable. We not only gained insight into how our members would prefer our navigational structure to be designed, but we also found out that our members weren’t understanding the way that we worded the names of certain pages. This gave us a chance to rename several parts of our website and see if those page names did any better in the following studies. Card sorts are also a great way to test out a page name that one person on the staff may want, but others disagree on it – it eliminates internal arguments because the results of what users want speak for themselves! With all of those studies done, we continued to develop and design our new website and it is nearly done. At this point what we’re doing is conducting another task-based usability study which will track how many clicks it will take for our members to complete pre-defined tasks. This will identify problem areas in our design. 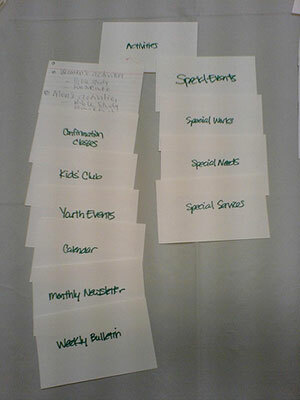 For this type of study what we’ve done Is designed a list of 10 tasks that each participant must complete and we are sitting them at a computer and using screencasting software to record their session. That way we can watch the videos at a later time and see where they went first when trying to complete each task, which ones they couldn’t complete, etc. After each person is done with their session we’re having a brief interview with them for user feedback. There are plenty of free screencasting application available for libraries to use for this type of study, see below for a list. After all of these usability studies, we are fairly confident that our website will be a reflection of what our members want, and since they’ve been involved with the design and creation of the site since the outset, they are very excited about the launch of the new design.